SAR439459 is a potent and selective antagonist of TGFβ isoforms, which block the immune response against cancer cells. By blocking TGFβ, SAR439459 promotes an anticancer immune response by maximizing the stimulation of T cells upon PD-1 inhibition. Cemiplimab is a human monoclonal anti-PD-1 antibody (a type of protein) that works by blocking programmed death protein 1 (PD-1), a cell receptor on immune cells that is involved in preventing immune cells from destroying other cells. Patients with histologically confirmed, advanced unresectable or metastatic solid tumor whom in the opinion of the Investigator do not have a suitable alternative therapy. Patient understands and has signed Informed Consent form and is willing and able to comply with the requirements of the trial. Eastern Cooperative Oncology Group (ECOG) performance status (PS) >1. 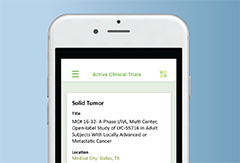 Concurrent treatment with any other anticancer therapy (including radiotherapy or investigational agents) or participation in another clinical study. Washout period of less than 3 weeks to prior anticancer therapy (including chemotherapy, targeted agents, immunotherapy, radiotherapy or any investigational agent). If the patient was treated with an agent having a short half-life, washout can be <3 weeks but no shorter than 5 times the half-life. For patients who received prior immunotherapies (including anti-PD-1 therapies), a washout period of at least 6 weeks is required before a patient receive the IMP. For nitrosoureas and mitomycin, patients with washout period <6 weeks are to be excluded. No washout is required for endocrine therapy but this treatment must be discontinued before the first cycle of study drug(s) administration. Patients with prostate cancer who are using a luteinizing hormone-releasing hormone agonist/antagonist can continue treatment. However, if these patients stop antiandrogen therapy, they must have a 3 week washout period to avoid withdrawal syndrome. Medical method (such as hormonal contraceptive) PLUS male condom. The choice of effective method is left to Investigator judgment, in accordance to local regulation. Sterilized or infertile subjects are exempt from the requirement to use of contraception. In order to be considered sterilized or infertile, subjects must have undergone surgical sterilization (vasectomy/bilateral tubectomy, hysterectomy, bilateral ovariectomy) or be a postmenopausal woman defined as 12 months or more with no menses prior to enrollment and over 50 years of age. Unwillingness and inability to comply with scheduled visits, drug administration plan, laboratory tests, other study procedures, and study restrictions. Significant and uncontrolled concomitant illness, including any psychiatric condition that, in the opinion of the Investigator or Sponsor, would adversely affect the patient’s safety or participation in the study. Active infections, including unexplained fever (temperature >38.1ºC), or antibiotic therapy within 1 week prior to enrollment. Any prior organ transplant including allogeneic bone marrow transplant. History within the last 5 years of an invasive malignancy other than the one treated in this study, with the exception of resected/ablated basal or squamous-cell carcinoma of the skin or carcinoma in situ of the cervix, or other local tumors considered cured by local treatment. History of known HIV, unresolved viral hepatitis as documented by the detection of hepatitis B surface antigen (HBsAg), and/or hepatitis C virus (HCV) antibody at the time of the screening visit. Any major surgery within the last 28 days. Patient is the Investigator or any subinvestigator, research assistant, pharmacist, study coordinator, other staff or relative thereof directly involved in the conduct of the protocol. Patients with primary central nervous system (CNS) tumors. Patients with central nervous system metastases of non-CNS primary tumors that are untreated, lesions larger than 1 cm in the longest dimension, symptomatic, unstable, considered active or changed in size in the latest scan compared to previous scan. Patients must not require corticosteroid treatment or have received treatment for brain metastases for at least 1 month prior to study entry. Patients with small (≤1 cm in the longest dimension), asymptomatic and treated CNS metastases which have been stable for at least 1 month following treatment with surgery or radiation therapy can be enrolled. History of congestive heart failure, myocardial infarction with reduced ejection fraction, symptomatic coronary artery disease, documented uncontrolled hypertension, major clinically significant ECG and echocardiogram abnormalities, significant ventricular arrhythmias, significant valvular heart disease (including valve replacement), vascular malformation, aneurysm, significant pulmonary conditions such as idiopathic pulmonary hypertension, uncontrolled chronic lung disease. History of chronic renal diseases, interstitial nephritis, or with uncontrolled or unresolved acute renal failure. Any of the following within 6 months prior to study enrollment: pulmonary embolism, deep vein thrombosis, active uncontrolled bleeding, infectious or inflammatory bowel disease, diverticulitis, intestinal obstruction or perforation and gastrointestinal hemorrhage. Inadequate hematological function including neutrophils <1.5 × 109/L; hemoglobin <9.0 g/dL; platelet count <100 × 109/L. Inadequate renal function with creatinine ≥1.5 × upper limit of normal (ULN), or between 1.0-1.5 × ULN with a creatinine clearance (CrCl) <60 mL/min/1.73 m² as estimated by using the aMDRD formula. Liver function: Total bilirubin >1.5 × ULN unless Gilbert’s syndrome (for this situation, total bilirubin >2.5 × ULN) or alanine aminotransferase (ALT), aspartate aminotransferase (AST) or alkaline phosphatase (ALP) >2.5 × ULN in the absence of liver metastases. In the presence of hepatic metastases, total bilirubin <3 × ULN and AST, ALT <5 × ULN are acceptable. ALP up to Grade 2, ie, <5 × ULN, would be acceptable only if related to the presence of bone or liver metastases as judged by the Investigator. Non-resolution of any prior treatment related toxicity to Grade <2, except for alopecia, according to NCI CTCAE version 4.03. Prior treatment with any anti-TGFβ inhibitors. Prior history or ongoing uveitis. Patients who received prior immunotherapy who developed toxicity leading to a permanent discontinuation of immunotherapy. Ongoing or recent (within 5 years) evidence of significant autoimmune disease that required treatment with systemic immunosuppressive treatments, which may suggest risk for irAEs. Immunosuppressive corticosteroid doses (>10 mg prednisone daily or equivalent) within 4 weeks prior to the first dose of SAR439459 and/or Cemiplimab(occasional use of inhaled, intraocular, nasal or topical steroids for symptomatic relief allowed). History of interstitial lung disease (e.g. idiopathic pulmonary fibrosis, organizing pneumonia) or active, non-infectious pneumonitis that required immune-suppressive doses of glucocorticoids to assist with management. A history of radiation pneumonitis in the radiation field is permitted. Patients with underlying cancer predisposition syndromes, including but not limited to, history of hereditary breast and ovarian cancer syndrome, Feguson-Smith Syndrome, Multiple Self Healing Epithelioma, Familial Adenomatous Polyposis, Multiple Endocrine Neoplasia or Li-Fraumeni syndrome, etc. Therapeutic doses of anticoagulants or antiplatelet agents (1 mg/kg bid of enoxaparin, 300 m g of aspirin daily, 300 mg of clopidogrel daily or equivalent) within 7 days prior to the first dose of SAR439459 (prophylactic use of anticoagulants are allowed). Prothrombin time (PT) or international normalized ratio (INR) > 1.5 x ULN unless the patient is receiving anticoagulant therapies; for patients receiving anticoagulant therapies, the PT and activated partial thromboplastin time (aPTT) should be within the therapeutic range of intended use of anticoagulants. Patients who have been withdrawn from the study treatment cannot be reincluded in the study. Their inclusion and treatment number must not be reused.